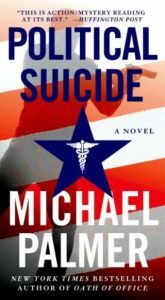 Today marks the release of Michael Palmer’s newest medical thriller Political Suicide and to celebrate, Palmer has graciously offered to giveaway a SIGNED Hardcover Edition here on the Lazy Day Books Blog! We’ll tell you how to enter for your chance to win at the end of our review. Political Suicide is the second book to feature Dr. Lou Welcome (following last year’s Oath of Office), but Political Suicide is a stand-alone story, easy to follow without having read the first one. And if you’ve never read Michael Palmer’s books before, this is a great place to start. I have to say the Prologue is one of the best I’ve read in quite a while and the shock value alone is enough to quickly propel you through many chapters while searching for answers to your questions. I mean, what kind of purely evil person would ever want to do such a thing to the truest, bravest, most honorable men of our armed forces? Because as soon as you read it, you know that wasn’t something these men signed up for, or were ever trained to do, or could ever believe in. Which means somebody did this to them. And that person absolutely must be stopped. He could sense their exchange was getting out of hand, and kept quiet by reminding himself, as he did from time to time for nearly every one of his docs, that whether the stone hit the vase, or the vase hit the stone, it was going to be bad for the vase. Dr. Lou Welcome seems an unlikely choice for our hero, but it works. He’s not afraid to follow the evidence wherever it leads, even straight into danger, but Welcome is equally comfortable letting others take the lead when their strengths are what’s called for in any given situation. Welcome is a thorough investigator and open to trying new things. And I think he naturally invites the readers’ trust. He’s just that kind of guy. You know, the one you call when you’re in trouble. In this case, that’s a very good thing indeed, as his friend Dr. Gary McHugh is in very big trouble. Of the murder charge variety. One of Michael Palmer’s great talents is the ability to know when you need a slow buildup of evidence to advance the story and build suspense and also to know just the right time to give you big action. He even sets the biggest scenes to an amazing soundtrack, painting a picture so clear and so bright, that you could easily see it play out on the big screen complete with swelling music that surrounds your senses. He really is a fabulous storyteller. A massive cover-up gone awry. A prominent physician accused of murder. Uncovering the truth could put the entire country at risk. Dr. Gary McHugh, known around Washington, D.C. as the “society doc,” calls his longtime friend Dr. Lou Welcome in a state of panic, certain he is about to be arrested for murder. McHugh was found in an alcoholic blackout in his wrecked car after visiting a patient of his, the powerful Chairman of the House Armed Services Committee, Elias Colston. Soon after McHugh leaves, Colston’s wife returns home to find her husband shot to death in their garage. McHugh has no recollection of committing the crime and no one who would possibly believe in his innocence, other than Lou. As more facts come to light, even Lou has serious doubts. But something about McHugh’s story nags at him and as he looks into matters, pieces of the puzzle don’t point to his friend’s guilt so definitively. With the help of Sarah Cooper, an ambitious attorney with her own reasons for hating doctors, Lou finds himself at the center of a deadly, high-level conspiracy where the difference between right and wrong is a matter of interpretation, and the words “whatever it takes” have a chilling meaning. If Lou and Sarah don’t uncover the real reasons Colston is dead, they may not survive themselves, and the entire country could be at risk for attacks that could destroy the very fabric of national security. I’ve been a long-time fan of Palmer’s medical thrillers and Political Suicide is another solid, entertaining thriller. I gave this one 4 Sunshines. Want to win your very own SIGNED Hardcover Edition of Political Suicide? Since we will use email to notify the winner, all entries must include a valid email address. We are giving away a physical copy of the book, so the winner will be asked to provide a valid mailing address. The winner will be determined by random drawing on Tuesday, December 18, 2012 at 8p CST. Updated Wed 12/19/12 1045a: Congrats Sue B., winner of the signed hardcover edition of POLITICAL SUICIDE by Michael Palmer. Sue, check your email for instructions on how to claim your prize. Thank you to all our participants, check back soon for more great giveaways!